The former Fizzary, now the site of an illegal gambling den. Photo: Joe Rivano Barros / Mission Local. An illegal gambling den that ran with virtual impunity in the Mission District for over a year has moved to an artist space in the Bayview, according to the tenant of a commercial warehouse space near Bayshore Boulevard. The tenant said he unwittingly subleased his art studio in the Bayview building to the same individuals who rented the Mission District space at 133 Lilac St. where a gambling den operated as recently as February. The tenant, who requested anonymity, said he subleased his studio on March 5 to a woman who said she wanted to run a janitorial business out of the space. The man declined to give the warehouse’s exact address, fearing retaliation from his landlord. The tenant of record currently lives in another state, and said that he had rented the studio space in the two-story Bayview warehouse for some five years when he decided to sublet it. The man said he found the subtenants using a Craigslist advertisement. Just weeks after the couple set up shop in the studio space, neighbors began complaining about loud music, increased traffic, and even a street fight that raised suspicion of illegal use of the warehouse space. “My neighbors said on weekend nights, it’s wild,” said the source. The tenant said that one neighbor told him that since the subtenants’ arrival, traffic has increased and the streets are now “packed with Mercedes and fancy cars” on weekend nights. That neighbor also reported “broken glass and noisy fights” in the middle of the night. Cameras set up outside of the studio space show the sub-tenants lugging cases of alcohol into the warehouse on weekends, according to the tenant. The tenant also said that his assistant, who works in the space above the studio, reported witnessing a pool table being moved into the space some two weeks ago. The neighbor’s complaints are similar to those made by neighbors of the former Fizzary, a Mission District soda shop at 2949 Mission St., where the gambling den first cropped up in October 2015. Back then, Taylor Peck, the Fizzary’s owner, said he subleased the storefront after his soda business shuttered. His new subtenants were a couple and another woman who said they represented the global nutrition company Herbalife and that they were seeking to open a brick-and-mortar shop. “They use that as their front,” said Peck, who continued living in a space above his storefront and quickly realized that he had been deceived when it morphed into an after hours party spot where neighbors alleged prostitution. Despite repeated calls for service, Peck said police were “wholeheartedly unhelpful” in thwarting the illegal operation. 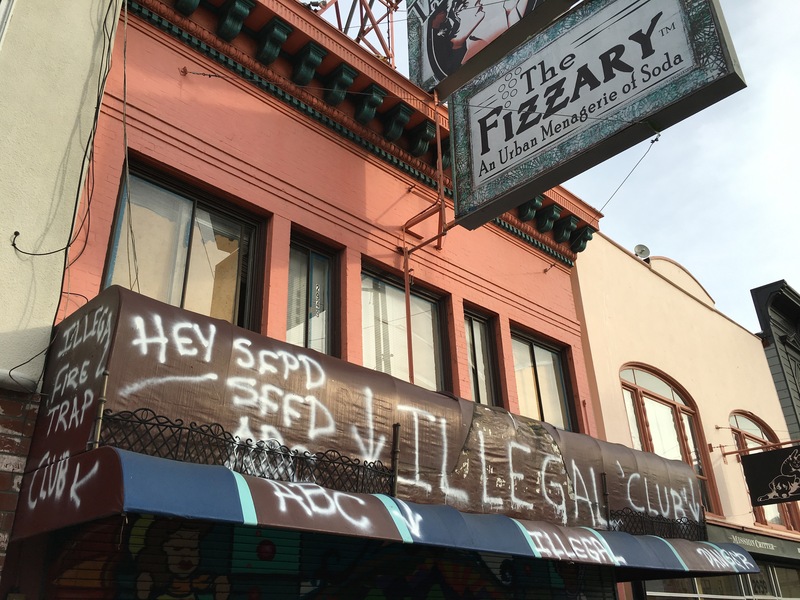 In a desperate attempt to inspire police intervention, Peck vandalized his own storefront in December 2015, spraying the words “illegal club” on the building. When Peck was evicted by the building’s owner a week later, his subtenants were forced out as well, but they soon returned when a property management company said that it unknowingly re-rented the the former Fizzary space to the same operators a year later, said Peck. Only this time, the gambling den proprietors ran the establishment out of the building’s back entrance, at 133 Lilac St.
San Francisco Spokesperson Robert Rueca said that complaints alone are often not enough to take action. Still, despite allegations that alcohol was being sold at that location, police were unable to cite the club’s operators because “when we came in to serve a search warrant we didn’t see the evidence,” said Rueca. Peck and the Bayview tenant corroborated the name of at least one person with whom they signed a sublease agreement, Blanca Leticia Mendez Rubio. When contacted, Mendez Rubio confirmed subletting the Fizzary’s former storefront and now the Bayview studio space, but denied any involvement or knowledge of the alleged illegal operations at both spaces. But the Bayview tenant is skeptical and recently hired a lawyer to begin eviction proceedings. He fears, however, that he may be forced to undergo the same lengthy legal ordeal as Peck, and in the worst case, face an eviction himself. Peck said his “heart breaks” for the Bayview tenant, who he said is the latest victim of an ongoing scam.